There are several vital components in the braking system of a vehicle. One particular component that is crucial is the brake master cylinder. You will find a brake master cylinder in both types of braking systems, which are the disc braking system and the drum braking system. A vehicle will have one or the other, but they all have a brake master cylinder. Whenever you step on the brake pedal to slow down or stop your vehicle, there is a lot going on in your braking system to make this happen. Basically, the pressure that your foot puts on the brake pedal gets converted into hydraulic pressure. It is the hydraulic pressure that causes the brake pads to push against the rotating disc brakes, or the brake shoes to push against the rotating brake drums. This creates the friction necessary to slow down the vehicle. You might be wondering how this pressure conversion process takes place. Well, as you’re pressing your foot down on the brake pedal, the brake master cylinder is transferring brake fluid to the brake circuit. The harder you step on the brake pedal, the more brake fluid that goes to the brake circuit. This is how the hydraulic pressure forms, which then causes the brake pads or brake shoes to create friction with the corresponding brake discs or drums. Federal law states that two brake circuits must be installed in every brake system. That way, if you were to have a malfunctioning brake circuit, you can still put on the brakes because you have another brake circuit in the system that works. Without that extra brake circuit, a faulty circuit would make it impossible to brake the vehicle. You can only imagine what the outcome of that situation would be. As for the brake master cylinder, it needs to remain functional always. If it were to stop working for whatever reason, the symptoms would become apparent right away. You cannot ignore these symptoms for too long because the safety of your driving is at stake. In the beginning, you may be able to get around for a little while, but you shouldn’t risk it. The worst possible scenario will be that your brakes stop working altogether. Don’t wait for the problem to get to that point. Replace your brake master cylinder as soon as you notice it is bad. Below are the top 5 symptoms of a bad brake master cylinder. Be on the lookout for them as you drive or brake your vehicle. 1) Brake Warning Light – Newer cars have brake warning lights on their dashboards now. This light will let you know if your braking system is having any issues. One such issue would be a faulty brake master cylinder. You won’t necessarily know immediately that your brake master cylinder is having problems just from this warning light alone. But if you experience any of the other symptoms on this list and your brake warning light is on too, then it is safe to say that your brake master cylinder needs to be replaced. 2) Brake Pedal Feels Mushy – Does your brake pedal feel mushy or spongy when you place pressure on it with your foot? If it does, then it could mean that your brake master cylinder is bad. This mushy feeling could be the result of a brake fluid leak in the brake system. The rubber seals of the brake master cylinder might be too worn out, resulting in a leak. 3) Not Enough Brake Fluid – If you start to lose brake fluid because of a leaky brake master cylinder, then you won’t have enough brake fluid for the brake circuit. Check the surface below the vehicle for leaky fluid. Inspect the cylinder and reservoirs to see where the fluid is leaking from. If it is coming from the cylinder, then it obviously needs to be replaced. Your braking ability will be impaired until you do. 4) Brake Pedal Sinks – The brake pedal should give you a little resistance when you press down on it with your foot. But if you find the brake pedal sinking very easily to the floor, take your foot off the pedal. If the pedal stays near the floor, then you have a bad brake master cylinder that needs replacing at once. 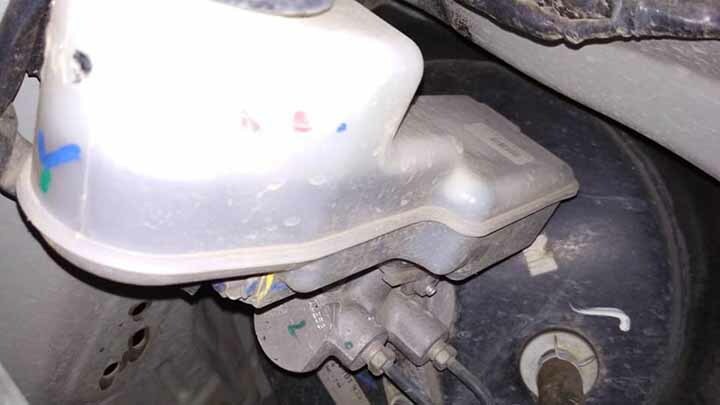 5) Contaminated Brake Fluid – When your brake master cylinder has worn out rubber seals, the brake fluid inside the cylinder is susceptible to contamination. All the debris and other dirty elements from the outside will be able to find their way through the worn rubber seals. If your brake fluid gets contaminated, it will be harder for your brake master cylinder to convert brake pedal pressure into hydraulic pressure. If you need to replace your brake master cylinder because it is not working properly, you can expect to pay a total of $300 to $520. To break this down for you, there will be parts and labor costs associated with this total. The cost of a new brake master cylinder component will be about $100 to $220. Since you’re likely not a certified or experienced auto mechanic, you will need to find a professional to perform this replacement job for you. Their labor rates are often quite steep, so you can expect the total labor costs to be between $200 and $300. And, of course, don’t forget about the added taxes and fees that are included with the total cost.